After the Islanders barely made the playoffs last year then made a quick exit once in, they hoped to use this off-season to retool and make another run at it next year. Yesterday was a cruel step in the wrong direction. The Islanders saw their team picked apart yesterday and find themselves without their biggest two weapons Ryan Smyth and Jason Blake going forward. The Washington Capitals pillaged the Long Islanders for forward Viktor Kozlov and defenseman Tom Poti and the Panthers picked up Richard Zednik. They lost 5 players on the opening day of free agency and this comes on top of the team cutting ties with center Alexei Yashin last month. 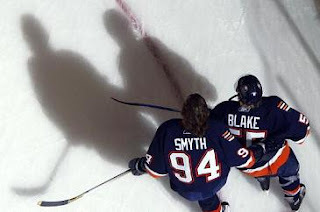 That move was an effort by the team to free up cap space which would enable them to sign both Smyth and Blake. The move was also seen as a way to attract Michael Peca back as the former captains did not get along playing together. While they were beaten out on all the higher-end free agents on Sunday the Islanders did manage to lure forward Jon Sim from the Atlanta Thrashers. Sim set career highs in goals scored and assists last season, but is not expected to be an impact players for the team. The Islanders will still try to salvage their off-season by picking up Michael Peca. The center played in just 35 games last season racking up 15 points while playing with the Maple Leafs. With these subtractions to the team and the only addition being Jon Sim and possibly Peca the Islanders playoff hopes for the upcoming season look to be dead. Although there are plenty of free-agents left on the market including Peter Forsberg and former Ranger’s center Michael Nylander, but the Islanders have to this point focused all of their attention to players who have already had the Long Island experience.